Uses : It is astringent, purgative, stomachic and laxative. It is useful in asthma, piles and cough. It is also useful in healing of wounds and scalds. It is used as gargle against inflammation of mucous membrane of mouth. 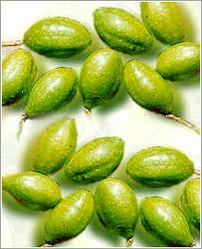 It is used in tanning of leather and purification of petroleum. It is an effective purgative and helps in removing toxins and fats from the body resulting in their reduced absorption. Used in all sorts of eye disorders like inflammation, conjunctivitis and is used as a wash.